Native to northeastern China and Japan, schisandra is valued as an aphrodisiac, although it is also used for coughs, diarrhoea, insomnia, and skin rashes. The berries are called wu wei zi in Mandarin, which translates as "five taste seeds", as the pulp, skin, and seeds combine the five classic tastes identified in traditional Chinese medicine. 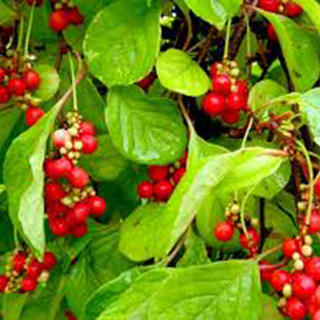 Schizandra is a nutritive and immune-enhancing tonic. The herb is good for treating cough, shortness of breath, impotency, stress, tiredness, allergies, chronic gastritis and dysentery. Schizandra also stimulates salivation and gastric secretion. Dilute 1fl oz (30ml) of tincture with 10fl oz (300ml) of water to make a lotion to bathe irritant skin rashes. Traditionally, a few berries are chewed as a tonic every day for 100 days. Drink 1 cup (1–4 tsp dried berries per cup boiling water), with a tiny pinch of powdered ginger added, 3 times daily for coughs and wheezing For insomnia, drink 1/2–1 cup without ginger before bedtime. Take 1 tsp (5ml) in water 3 times daily for poor liver function. Put 4oz (115g) of berries in a jar and cover with 1 pint (600ml) of rice wine. Seal and leave in a cool place for 1 month, shaking the bottle occasionally. Strain and take a sherry-glass dose daily as a tonic or to improve sexual energy. Prefers rich, well-drained, moist soil against a sheltered, shady wall. Sow ripe seeds in autumn in a cold frame; soak seeds sown in spring overnight first. Grow until well established before planting in final positions. Must be trained against a wall or fence; remove unwanted shoots in late winter. Both male and female plants are required to produce berries. Collect the fruits after the first frosts and sun-dry them.